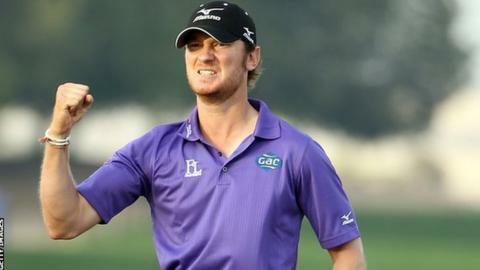 Bristol's Chris Wood has set his sights on a place in the world's top 50 so he can compete at this year's Masters. The 25-year-old has risen 82 places to 60th in the rankings following his maiden European Tour victory at Qatar on Saturday. And Long Ashton-based Wood told BBC Radio Bristol: "It's opened a few more doors for me. "I'll be involved in more World Championships, and reaching the top 50 to go to the Masters is my target." Wood qualified for the competition in 2010, after finishing in the top four at The Open at Turnberry, but he missed the cut by seven strokes. Wood's stock has risen again since August, when he claimed his first professional win at the Thailand Open, and his first European title has given him a further boost. "It's a big weight off my shoulders," he said. "I've had a couple of tough years with my back injury but I've got myself in to a better position now. "I need to keep pushing on and I've got the confidence to keep winning." And Wood, who is now in Dubai for the Desert Classic, is embracing the attention that came with his impressive win in Qatar - which he secured with a birdie on the 18th hole. "My Dad watched it on his own at home. He told me that when I holed the putt on the last he jumped up and hit his head on the ceiling. "I had to leave it a couple of hours before I could speak to either of them [his Mum and Dad] as I knew it was going to be quite hard for them and myself. "I had over 100 texts on my phone when I eventually turned it on, along with emails and tweets. I even got a tweet from [three-times Masters winner] Gary Player on Saturday night which was amazing."